The blog post originally appeared in American Theatre and our sincere thanks is given to them for their kind permission to republish. After a brief out-of-town tryout near Shanghai, the cast, crew, and creative team of the new Chinese jukebox musical The Secret journeyed north to Beijing for opening night last Dec. 23. It was a bad time to travel, as “airpocalypse”—the worst air pollution of 2016—circled the capital city, grounding hundreds of flights. With restrictions on vehicles based on license plate numbers (to reduce road traffic), trucks carrying the physical production of The Secret had to be directed to the outskirts of Beijing, then unloaded and reloaded into vehicles with the right-numbered license plates for the day, before finally arriving at the Tianqiao Performing Arts Center. Strolling through the Temple of Heaven park opposite the thea­tre the day before opening night, Marc Acito, the show’s librettist, recalled some of the challenges of bringing a new musical from a January table read to a December opening night in a country still in the early stages of adopting such Western musical theatre staples as workshops and previews. The Secret is a high school romance about gifted music students with a bit of time travel thrown in—Fame meets Back to the Future. At the table read in January at a studio in Shanghai, Acito and director John Rando agreed on Chou’s song “Dream Started” for the musical’s final graduation scene. It’s a song about seizing opportunities, smiling through setbacks, and persevering to achieve one’s dreams—in other words, themes and emotions familiar from Western musical theatre. “This is very different from what the film was,” said Rando, who directs frequently on Broadway and at U.S. resident theatres. “One of our goals was to create a very uplifting and moving finale to the story that I thought would be much more appropriate for the musical theatre version of the romance. 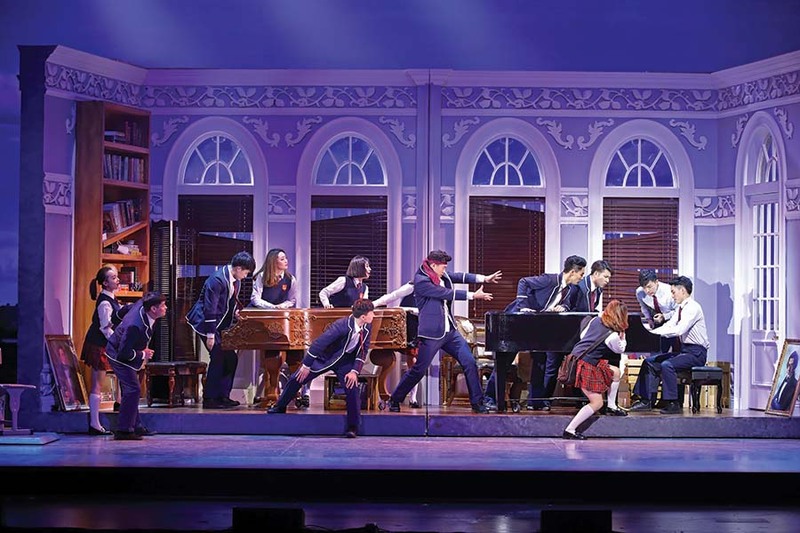 In promoting the musical to Chinese audiences, the show’s American producer, Marc Routh, said that they are trying “to explain to audiences that this is a unique opportunity to experience a homegrown musical with the craft and experience of a truly A-list Broadway creative team.” Conceiving, developing, and producing an original Chinese jukebox musical may have been the logical next step for Routh, co-executive producer (with Simone Genatt) of Broadway Asia. Routh has watched the progress of musical theatre in China for more than 20 years, while licensing American musicals in Asia and presenting English-language tours of titles such as The Sound of Music. In a long courtship process, he pitched treatments of Chou’s catalogue to the pop star’s manager before lining up a commitment to adapt The Secret. It was then that he recruited Acito. Many Chinese people keen to enter the musical theatre business acknowledge that the form is still relatively new here. Despite a supply of talented and well-trained performers, there is not yet a wealth of Chinese artists versed in writing, directing, or designing for Western-styled musical theatre. Assistant director Chen, who also worked on Sleep No More in Shanghai, thinks that collaboration with foreigners is what Chinese musical theatre needs to become more commercially and artistically successful. To further that cross-cultural education, Richard Fei, programming director of Shanghai Culture Square —a 2,000-seat theatre on the site of a former greyhound racetrack popular with Westerners in the 1920s and 1930s—has been programming a musical theatre development symposium every spring since 2014. Inviting experts from Europe, North America, and more established musical theatre industries in nearby Japan and South Korea, Fei programs seminars on topics such as producing, casting, marketing, and ticketing musical theatre. He also programs showcases of new musical theatre, seeking to stimulate the industry’s progress as much as possible. Fei started out in the business at Shanghai Grand Theatre , translating and operating the subtitles for tours of Cats, Phantom, The Lion King, Mamma Mia!, Hairspray, High School Musical, and The Sound of Music before taking on his current position. Those touring productions gradually enjoyed longer runs in Shanghai and had a major impact on developing the audience now attending foreign tours at Shanghai Culture Square, where upcoming productions include Ghost, Wicked, Sister Act, Legally Blonde, West Side Story, and The Producers. Fei also produces one local production per season. “This theatre is for the young generation,” he explained. That may explain why, in 2016, Shanghai Culture Square produced Spring Awakening, already popular with amateur student musical theatre groups. In 2017, Shanghai Culture Square will produce the Mandarin-language premiere of a Korean musical, My Bucket List, adapted from the 2007 Rob Reiner film The Bucket List. The musical version, which recasts characters created by Jack Nicholson and Morgan Freeman as young men, was part of a road show of Korean musicals promoted last year during the Shanghai Performing Arts Fair. Fei also brings in British, American, and French musical theatre stars in revue shows, and collaborates with foreign producers such as Austria’s Vereinigte Bühnen Wien to bring original productions of globally successful musicals including Elisabeth and Mozart! to China, where they are performed in German with Mandarin subtitles. Decades after Deng Xiaoping’s reforms reoriented communist China as a market economy, musicals—with their typically aspirational narratives—may seem a natural fit for a society that has increasingly embraced capitalism. Though foreign brand names punctuate Chinese cityscapes, the screening of foreign films is highly limited by government quotas, perhaps giving live foreign musicals an edge for Chinese consumers seeking a foreign cultural experience. With ample examples of successfully imported foreign musicals being regularly (and profitably) performed in neighboring Japan and South Korea, it is no surprise that savvy Chinese producers would seek to establish a musical theatre market in China, home of the world’s largest middle class. Since George C. White, founder of Connecticut’s Eugene O’Neill Theater Center, directed a Chinese cast in The Music Man in Beijing in 1987, the Western musical has been popularized in China through productions of classics such as Man of La Mancha (first in English, later translated into Mandarin), but also through productions of more contemporary shows, like a replica staging of Mamma Mia! in 2011 and a localized production of Avenue Q in 2013. 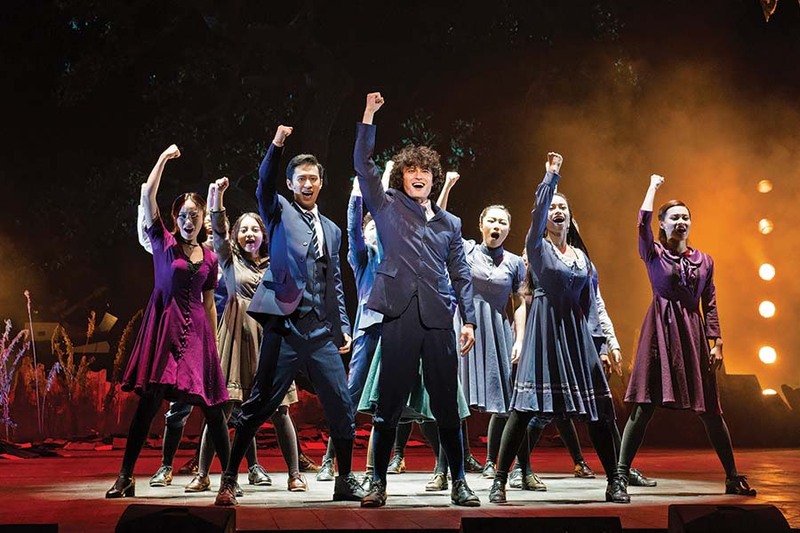 While Chinese producers, actors, and fans regularly travel to sample the wares in nearby Japan and South Korea, original Korean musicals are also being presented in China. The long-running Korean musical Laundry, about working-class neighbors pursuing their dreams in Seoul, was presented in Beijing with Chinese subtitles in 2016, and will be produced in Mandarin this year. From its Shanghai office, the Korean producer CJ E&M is also testing out Korean production models in China. These range from producing Stephen Dolginoff’s edgy, small-scale 2005 Off-Broadway musical Thrill Me to bringing a large-scale, star-vehicle Jekyll & Hyde from Korea, translated into Mandarin and directed by David Swan, an American. If many of these musicals are still directed by foreigners, producers are increasingly coming from local ranks. Ivy Yang, who learned about musical theatre at Peking University, was working as a venture capital analyst in Tokyo, and noticed that musical thea­tre tickets were on sale in convenience stores. Recognizing an opportunity to develop the market at home in China, she returned in 2011 and reconnected with a director she met at Peking University, Joseph Graves, eventually forming the production company Seven Ages with her own savings. Their first show was to be Man of La Mancha, which had been a hit in Japan and Korea. But when Music Theatre International asked for a license fee Yang could not afford, she flew to New York to personally persuade the musical’s composer, Mitch Leigh, to give them the license at a much reduced rate. Yang went on to produce Man of La Mancha in 2012 in English with Mandarin subtitles, then in translation. Avenue Q followed, with many tweaks in the script helping young Chinese spectators relate to Princeton (renamed Tsinghua, after the Beijing university) as he struggles to find a job after graduation. Graves also directed Seven Ages’ productions of How to Succeed in Business Without Really Trying and The Sound of Music. Chinese musical theatre is dominated by women like Yang, educated at elite Chinese universities, often studying abroad for a period (in her case, at Harvard), and initially working in banking or finance. While Yang’s employees in Seven Ages’ Shanghai and Beijing offices are clearly inspired by their boss, she hesitates to call herself a role model. “Women hold up half the sky,” she points out, citing a famous pronouncement of Chairman Mao, and suggesting that it’s simply in the nature of Chinese women to work hard. With little initial funding, Yang has relied heavily on social media platforms to market her musicals and sell tickets. Julia Yuan, the company’s marketing director, started her career as an attorney but eventually quit law to work for Seven Ages, running its new media platforms, including Douban, Weibo, and WeChat, as the company prepared the Chinese premiere of Avenue Q. Like many working in musical theatre in China, Yuan doesn’t come from a theatre background, but she’s long been a passionate fan. Her primary task: to educate potential ticket buyers on what musicals are exactly, and how they’re different from traditional Chinese opera and spoken drama. To achieve this marketing goal, Yuan posts synopses and production histories on social media platforms, generating enthusiasm among musical theatre fans, whose positive comments are crucial to buzz around Seven Ages musicals. Seeking to connect musicals with other pop culture entering the Chinese market, Yuan has written articles and produced lighthearted videos about stars of Marvel films who also appear in plays and musicals, and has begun to attend Comic Con gatherings in Shanghai and Beijing, hawking pins and T-shirts emblazoned with the Avenue Q song title “If You Were Gay.” Seven Ages also collaborated with a Chinese LGBTQ group, promoting Avenue Q on its WeChat and Weibo accounts. 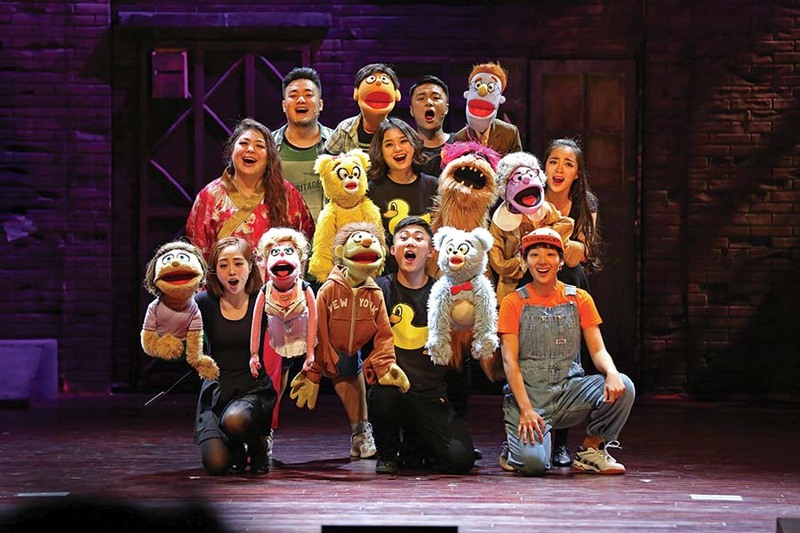 Given the musical’s central theme of post-college aimlessness, Seven Ages also reached out to Chinese college musical theatre clubs, offering lectures and previewing some of the work that went into Avenue Q. As a result, that show is now among the most popular with Chinese student musical clubs. Social media isn’t just good for marketing—it’s also how actors find out about auditions, often via a group chat on WeChat. The small, close-knit Chinese musical thea­tre industry is divided between the capital Beijing and the cosmopolitan finance center, Shanghai, requiring actors to shuttle between the cities for auditions and rehearsals. Jenny Ding graduated from the musical theatre program at the Shanghai Conservatory of Music and was quickly cast in the Chinese company of Mamma Mia!. She went on to appear in Cats in Korea and Miss Saigon in London. Rather than waste time off between jobs, last year she opened a suburban dance studio in Shanghai, where she teaches ballet. Even on the Dragon Boat Festival public holiday, Ding was at work, in case anyone found her dance studio via reviews on the social networking site Douban and wanted to tour the facilities. Ding starred as Wendla in Spring Awakening last fall at Shanghai Culture Square and was due to play Lucy in the upcoming Jekyll and Hyde, but left that production before rehearsals began to play Nala in The Lion King, now entering its second year at the Walt Disney Grand Theatre at Shanghai Disneyland. “Every time I audition for a European or American director, they choose me as the first leading female, but if I audition for an original Chinese musical, I never get the job,” Ding said of her casting fortunes. A charming actor who radiates joy in performance, it’s easy to see how Ding appeals to directors and audiences. But in a young industry still experimenting with longer, even open-ended runs, her experience performing eight shows a week in Korea and London sets her apart from performers with less stamina and experience. For now, even many Chinese musical theatre fans remain skeptical of homegrown efforts. Said Yuan, “Some Chinese artists, they think they can do musicals, and they try…” she trailed off. Wencong Chen concurred, explaining, “I think a lot of musicals right now in China—they write the script and write the music all separately, then create the choreography, then bring the actors together at the end, when all is created.” This can lead to storytelling redundancy, as each element may end up repeating points that have already been made, rather than integrating elements into a forward-moving whole. But while Broadway-style integrated musical theatre storytelling takes time, in China, Routh pointed out, relatively quick fundraising means projects also move quickly. The Secret has been completed in about a year. Michael Rubinoff, producer of the Canadian Music Theatre Project that incubated Broadway’s Come From Away, is also contributing to the development of a new musical in China called Bethune. He’s recruited Canadian writers Neil Bartram, who will write music and English lyrics, and Brian Hill, who will pen the English book and direct, as well as Chinese playwright Nick Rongjun Yu, who will write the Mandarin lyrics and book. The musical is inspired by the life of Norman Bethune, a Canadian physician who helped bring Western medicine to China during the Second Sino-Japanese War in the late 1930s. “The team is collaborating to create a more Mandarin version to be presented in Shanghai, and a more English version to be presented in Canada,” Rubinoff explains. The first workshop will take place at the Canadian Music Theatre Project in September, followed by a workshop at the Shanghai Dramatic Arts ­Centre in May 2018, and a Chinese premiere in Shanghai in 2019. Back in Shanghai in December, university students wrapped up amateur mountings of Mamma Mia! and Legally Blonde. The Leopold-and-Loeb-inspired Thrill Me was in its second run, having enjoyed a successful premiere in the summer of 2016. Across town, The Sound of Music was struggling to fill the 1,000-seat People’s Theatre, and there were technical glitches: The venue’s limited technical facilities and slow cuing meant drops representing the Alps or Nonnberg Abbey had to be raised and lowered mid-song to ensure they were in place in time for subsequent scenes. Bracing for another touring season, the production also had a banner prominently displayed in the lobby to recruit additional von Trapp children. Stage moms are few and far between in family-focused, academically minded China, making for an added challenge in casting and maintaining a full complement of von Trapp types. For their part, Chinese children and their parents have shown more interest in another Austrian import, as they’ve flocked to the musical Mozart!, performed in German with Mandarin subtitles at Shanghai Culture Square. Despite these challenges—from air pollution to imperfect venues, from linguistic and casting hurdles to inconsistent audiences—Chinese musical theatre producers, performers, and spectators remain bullish on this popular Western form’s future in China. The potential is there: Institutions such as the Beijing Dance Academy and the Shanghai Conservatory of Music are training triple-threat performers, and new venues are under construction, such as the five-theatre Dream Center in Shanghai. The private equity fund China Media Capital is backing this building project, as well as producers like Seven Ages, and they’re also investing in Broadway imports like Something Rotten! through Kevin McCollum’s Broadway Global Ventures. And this spring AC Orange International, a Chinese entertainment company that has also invested in such Broadway musicals as Waitress and Sunset Boulevard, will present 85 performances throughout China of a touring production of Wicked. Laura MacDonald is a senior lecturer in musical theatre at the University of Portsmouth in the U.K. Information on the AHRC International Placement Scheme for 2018 is available on the website , which also contains details of regional events. This years scheme closes for applications on 25th January 2018. A version of this story appears in the May/June 2017 issue of American Theatre. Categories: Cultural Heritage, Uncategorized | Tags: acito, american theatre, Asia, avenue q, Back to the Future, beijing, bethune, blog, brian hill, Broadway, bucket list, canadian music theatre project, cats, China, daning theatre, douban, dragon boat festival public holiday, Dream Started, eugene o'neil, Fame, Fist of Fury, grease, International Placement Scheme, Japan, Jay Chou, jekyll and hyde, John Rando, korea, laundry, laura macdonald, legally blonde, mamma mia, man of la mancha, mandarin, marc acito, marc routh, michael rubinoff, miss saigon, mitch leigh, musicals, my fair lady, neil bartram, nick rongjun yu, nonnberg abbey, peking university, pinyin, shaghai grand theatre, shanghai, shanghai conservatory of music, shanghai culture square, shanghai disneyland, shanghai performing arts fair, sound, sound of music, spring awakening, stephen dolginoff, temple of heaven park, the lion king, The Secret, tianqiao, university of portsmouth, vereinigte buhnen wien, Wang Xiaojing, wencong chen, western, zach woodlee | Permalink.